On February 1st (January 29th, old style) the Church commemorates the great desert-dweller, the venerable Saint Macarius of Egypt. St. Macarius was born in 301 A.D. in Egypt, on the western shore of the Nile, in a pious family. Having dedicated himself to a truly Christian life from childhood, upon the death of his parents he departed into the desert of Nitrea, and from thence, in obedience to an angel’s revelation, into the Scythian desert, where he excelled in prayer and monastic life. When St. Macarius reached the age of 40, he received from God the gifts of miracle-working, prophecy and power over the evil spirits. At the same time he became a priest and the abbot of his monastery. The power of the saint’s grace was so great, that he could even resurrect the dead. A multitude of people came from everywhere to visit St. Macarius - for spiritual benefit, for instruction, for the healing of illnesses. 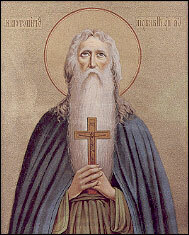 St. Macarius died peacefully at the age of 90. The visible world, from kings to beggars, is in a state of agitation, dissension, struggle, and not one of them understands the cause of it, i.e. the evil that occurred as a result of Adam’s sin, the sting of death; for the sin that came into the world, as some sentient force and the very essence of Satan, sowed all manner of evil: it secretly acts upon man’s soul and mind, and battles with him by means of thoughts. People do not realize that they commit evil, being motivated by a certain alien force; on the contrary, they believe that evil is a natural occurrence and that they commit it through their own reasoning, but those who keep Christ’s peace and enlightenment in their minds, know from whence this evil and these battles arise.